This was Carr St and it was a busy shopping area , but today its gone. It stretched from Ellison St to Prince Consort Rd. I was born 1944 and can remember a couple of shops in the street. Wards had a drapery shop and Fionda's had an Icecream Parlour. This is where there was an old Lead Works. Palmer's Ship repairers next door to Hawthorn Leslies. This is Edwards St named after Victoria's eldest son who later became King after she died. It had been renamed because the original St was called Colling St and the lane was called Collins Lane. Lots of Irish immigrants lived in that street/lane. This little building was the Hebburn Telephone Exchange at the side of Prince Consort Rd. Locals called this empty land 'Tennant's Field' . In the mid 1860s the Glasgow based Tennant's Chemical Works were set up in Hebburn. When they closed down the land was left derelict . The Hedley Schools on Argyle St which are still there today. Smith's the Printers on Albert St/Lyon St corner. This was Maggie O'Rourkes fish'n'chip shop on Bewick St/Cuthbert St corner. In the 40s through to demolition this was a Paper Shop run by Winnie Gallagher. Across from it on Bewick St was a General Dealers called Newlands. This corner shop was Fionda's on Ellison St- St Andrews St corner. My dad William B Dunn was born in this property 47 Lyon St Aug 11th 1922. Battle Class destroyer? outboard of Oil Tanker. This area was known as 'The Bauxite' . Bauxite is the ore where aluminium is extracted from. 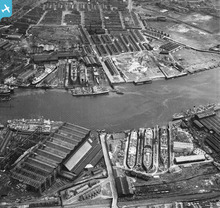 This was where in 1919 the Newcastle Shipbuilding Company started building ships. They went bust two years later. The Platers sheds further up the bank became the Reay Gear Works in the late 1920s. Ferry landing, below Benton Way. Earlier ferries are mentioned in William Richardson's History of the Parish of Wallsend (1923). R & W Hawthorn Leslie, of Hebburn, had problems in 1901, getting the newly constituted Wallsend Borough to accept their plan for steam launches to carry their workers. The Evening Chronicle reported that Mid-Tyne Ferries had lost £141000. The operator, Swan Hunter, had declared them too expensive. The 3 boats, built in the 1940s, would soon need replacements - 3.7.1979. Manager Harry Rowell commented on a strike over passenger rowdiness; the boats were "Tyne Queen", "Tyne Duchess", "Tyne Princess" - Journal 15.3.1980. This path led to what locals called the 'Wooden Bridge'. At the other side over the railway line was Hedgely Rd running right & left. If you turned left it led to Black Rd. If you turned right it led up past the Pyrotenax factory & then the Bitumastic Factory & onto Station Rd. This factory is the 'Reay Gear Works' but it was originally the Plater's Sheds belonging to the Newcastle Shipbuilding Co that started in 1919 & went bust in 1921. You can see the little slipways at the riverside in front of it. Caledonian St. The 'Dock Hotel' was just next to this identification flag. Bonnacord St named because of the workers that came down from Aberdeen to work for Andrew Leslie's shipyard post 1853. Bonnacord was Aberdeen's motto. I lived in that upstairs Flat (14 Lyon St) 1944 to 1953 when I was 9yrs old. I watched the Theatre Royal burn down across the road in October 1950. It was a Friday night & I had been looking forward to seeing the next episode of something I've now forgot. Probably Marvel Man or Cpt Marvel. Hawthorn Leslie's Shipyard where the famous HMS Kelly was built. Kelly was commanded by Lord Louis Mountbatten & he often attended Armistice Day celebrations in Hebburn. 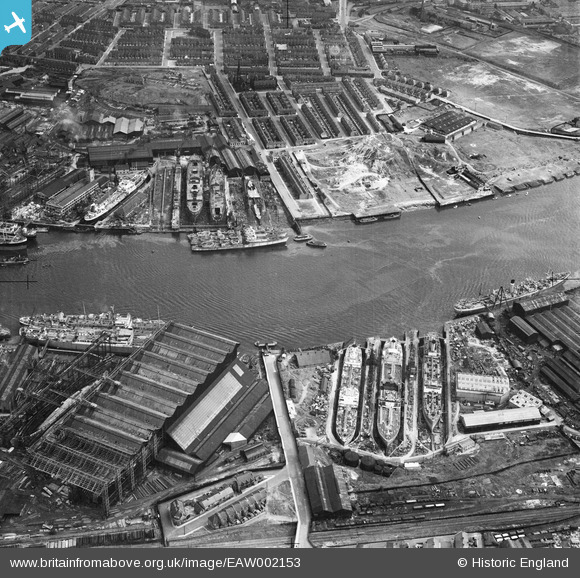 This shows part of Tyne View Tce which belonged to the Tenant's Chemical Works in earlier years. My McNeill relatives later lived in the house 1940s & 50s & told me there was a Tennis Court at the house which is probably what can be seen alongside the house. Ann St & the gap is where German bombs blew up the houses that were there pre war. The Ballast Hill which during WW2 had guns mounted on the top to shoot down German bombers. These are three incomplete "Battle"-class (1943 batch) destroyers, HMS "Mons", "Poictiers" and "Jutland" (furthest from camera, the only one with turrets shipped). They had been launched and construction suspended at the wars end. Only "Jutland" would be completed. Suggest that the 'Redundant destroyers or frigates with gun mountings removed' are in fact three 'Battle' class destroyers, built on the Tyne and incomplete at the cessation of hostilities. That furthest from the camera has some of her armament fitted, the two nearer have not. Hard to be certain which ships they are, but must be three out of 'Agincourt', 'Alamein', 'Aisne', 'Albuera', 'Corunna', 'Oudenarde', 'Jutland', 'Gabbard', 'Saintes' or 'St.Kitts', all of which were Tyne-built. Some of these ships were subsequently completed; others eventually scrapped, incomplete. Sources: John English, 'British Fleet Destroyers 1941-45', & George Moore, 'The Battle Class Destroyers' in 2002-2003 edition of 'Warship' annual. Further confirmation suggests ships are Agincourt, Alamein and Jutland, all built by Hawthorn Leslie. The former two were completed, the latter was used for explosives tests and then subsequently scrapped.